"A suggestion to move the population of Hong Kong to Northern Ireland sparked a flurry of correspondence in Whitehall in 1983, newly released documents show." "The bizarre plan was revealed in files published by the National Archives." "The novel idea came from a lecturer who warned that the British colony's 5.5 million inhabitants would need a home when it was returned to China in 1997." "It sparked some debate among officials, with one saying there were "real advantages" in taking it seriously." More of yer CLICKBAIT .. sack.
" You are confusing two different 'plans'. This article refers to a 1983 Civil Service file written as a joke (it even had the word Spoof written across the front cover) as clarified by one of the two civil servants involved, David Snoxal, on Radio4 today. The plan mentioned in "Failure in British Government" was a 1989 document by Douglas Mason and that had Scotland as the destination "
WOULD THERE BE ENOUGH CORNERS FOR ALL THE TAKEAWAYS? No problem Brixmis sure there are two corners on every Street! Surely this was aimed at Northern Ireland and not Ulster ? 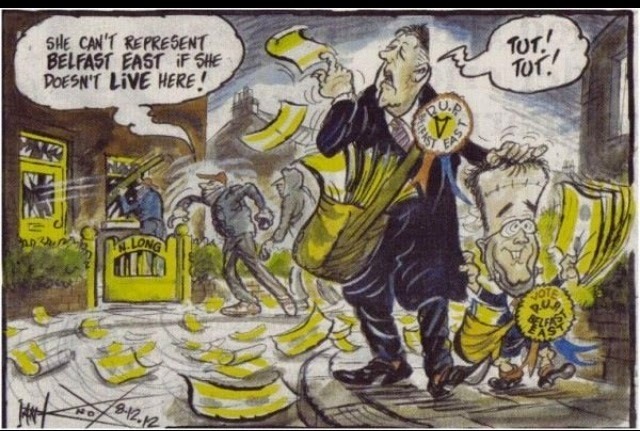 "Anna Lo at an Alliance party conference. She received verbal and physical threats from racists in Belfast."